Are you enjoying free food today? As a Rewards member you earn points for everything you purchase. On average, the points for one meal would get you half way to free goodies like a slice of Pizza, a Soda, or a Jumbo cookie. All you need is a name and a phone number. No cards to carry around, no key tags. It’s super easy. Not a member? What are you waiting for? Keep scrolling and join today and get rewarded for eating good food! 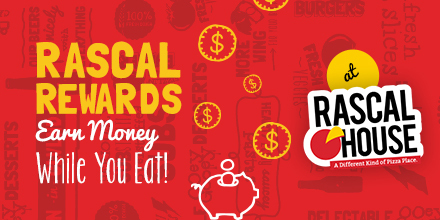 Earn points for every dollar to put towards great food and prizes. The points you earn are tied to your phone number, so make sure you use it every time you order. Points are accumulated at each location so be sure to include your main location when you sign-up. Fill out the form below & start earning today! All Images © Rascal House, Inc.